I have a confession to make. This weekend, I bought my kids super-processed, sugary, fake-flavored, packaged in Peoria, and shipped-across-the-country-breakfast cereal on Saturday. We were in Target buying track pants and the boxes were there in front of me as we walked in to check out. Here’s the rub. The kids didn’t ask for them. I wasn’t standing in line waiting for hours– so I they weren’t staring at me and tempting me. They were there as I whizzed in to the empty cashier and as I saw them out of the corner of my eye, I grabbed them. The kids were excited. Frenzied. Almost titillated. They’ve come to expect my slightly erratic food choices. I can go ballistic over a white bagel and then turn off the high way for ice cream. It makes no sense. “Where is my mom and what have you done with her?” they ask when I say yes to a root beer float or piece of candy. There is a tiny bit of method to my madness. Although I’m not sure my argument really holds water – as I test it out. You see, I have, what I call, a “cultural pass”. That means on occasion, I will allow myself to indulge in non-local, potentially garbage making food if there is a cultural benefit to it. This pass works for street tacos, (although I won’t eat non-grass fed beef), any ethnic restaurant including my lunchtime Cuban favorite Sophie’s, and sometimes, it appears, Halloween-inspired breakfast cereal. I never liked Booberry and Frankenberry when I was their ages. But I remember the appeal of all that Halloween drek and I remember wanting it. That childhood longing came out in full force, so strong, I didn’t need the nag factor to sweep the two boxes into my card. Buying those garish boxes of cereal for my kids gave me a lot of pleasure. But here’s the problem. Now that they are in the house, the kids want to eat it! Imagine that. They want to eat that cereal for breakfast. They want to eat that cereal for a snack. As I say “no” I realize how ridiculous I must sound to them. I think there is some value in creating balance. But I don’t want to set up processed or junk foods as something special – they’re not. They’re the opposite of special. But, I was raised in a time and place where cotton candy and chocolate MacDonald’s milkshakes and cartoon-inspired breakfasted cereals were something you got on special occasions. And sometimes that comes back at me with the force of a tsunami. 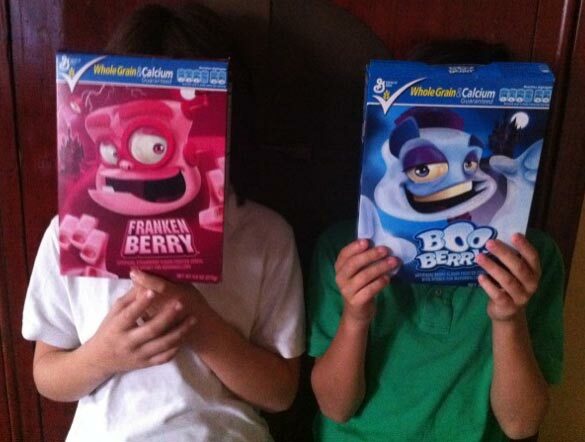 Am I sorry I bought Booberry and Frankenberry? Yes. Will I do something like this again. Maybe. We are faced with a million choices everyday. I’m trying to make up some rules for myself that will help me make the right choices more often than not. And apparently, sometimes my rules are not working perfectly. He didn’t argue –much. In fact, he seemed to understand. And actually, that’s a pretty big thing.